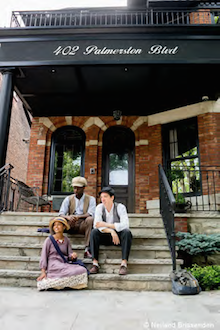 History comes alive on the porches of a Toronto neighbourhood inThe Postman, a beautifully-executed site-specific play about Albert Jackson, the first African-Canadian letter carrier. It’s performed as part of PANAMANIA, the arts and culture festival presented in conjunction with the Toronto 2015 Pan Am/Parapan Am Games. Born a slave in Delaware, Jackson escaped to Canada as a child via the Underground Railroad and moved to Toronto where he was eventually hired by the postal service in 1882. While Blacks were ostensibly free in Canada they still faced horrendous racism and Jackson’s white co-workers protested his hiring and refused to train or work with him. It took an intervention by a vote-seeking Sir John A. MacDonald before Jackson was finally allowed to work as a letter carrier. I work in The Annex/Harbord Village so I’ve spend a lot of time in that lively neighbourhood hopping between its charming dive bars, myriad of cheap sushi joints and colourful fro-yo shops. The neighbourhood is the setting for The Postman, a promenade performance staged on the porches of several houses along Jackson’s original delivery route. I love the fact that this show focuses on the neighbourhood’s history and that it has an accessible, community feel to it; curious passersby would stop and look on and ushers would hand them flyers for the show. The production is big for this type of show. Collaboratively written by a team of writers and composers, the cast features 17 actors and musicians and a large “front-of-house” team wrangles patrons and directs traffic. Promenade performances tend to be fussy and unwieldy; the action stops and the audience is shuffled off to the next location and needs to settle in before the next scene. Thankfully, the transitions in The Postman are surprisingly well-executed, joyous affairs where cast members play music and sing original music by composers Saidah Baba Talibah and Brooke Blackburn as we walk. For a production of this size it all runs remarkably smoothly, kudos to director David Ferry and his team. The show itself is a portrait sketched out in a series of songs and vignettes with a flashback structure that jumps between various times and locations in Jackson’s journey. While the structure mostly works, because of the jumps and some cast doubling choices, I sometimes had to re-focus a bit at the start of each scene to determine when the scene was taking place and who the characters were. It did take me out of the performance a bit but it wasn’t long before I caught on. I liked the fact that when Prime Minister MacDonald finally does intervene so Jackson can become a letter carrier, he’s characterized not as a white saviour but more like a shrewd politician (probably closer to reality given what we know of Sir John). The scene near the end between Jackson and his mother before his first day on the job is also particularly poignant. When she tells him, “You don’t get to make mistakes … You’re going to have to work twice as hard (as a white man) to get the same respect,” I fought back tears; my mother had given me the same speech before my first day of school. It’s a universal truth for people of colour that really hit home for me. That’s also why I think works like The Postman are especially important. The history of Canada’s communities of colour are still almost never included in school history curriculums and stories like Jackson’s risk getting lost in the annals of history. It’s a bonus that this particular show is also so accessible, well-executed, engaging and entertaining as well. The Postman is playing from July 12 to 19, 2015. Staged from selected porches on Brunswick Avenue, Major Street, and Palmerston Boulevard, with additional performances at Margaret Fairley Park. Ticket holders will receive an email on the performance day informing them of the audience meeting point for each particular show. Tickets (Startinag at $13) are available online. The current run is sold out. For information about potential holdover performances July 21 – 26, seewww.thepostmanwalks.com.